What is the Student Aid Report? 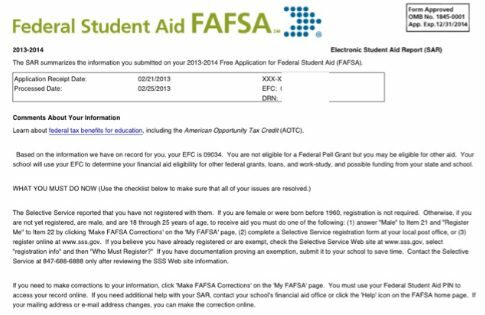 The SAR report is an important financial aid application confirmation report after you submit your FAFSA. This report will list any issues with your application that must be resolved before you are eligible for financial aid for college. After your submit your FAFSA application for student financial aid, you will received a Student Aid Report. Do not ignore this - it is very important. If you included a valid email address for the student on the FAFSA, you will receive an email with a link to your electronic SAR report (see example above). If you don't have a valid email address, you will receive the SAR report in the mail in ~ 2-3 weeks. If your application is complete, you will have a EFC displayed on your Student Aid Report. If your application is incomplete, you will have a list of items that need correction. Note: When you login online at fafsa.ed.gov, click on the button "VIEW PROCESSED INFORMATION". A new window will open and the top of this document is your SAR report. You may also have an EFC, but still have items requiring your immediate attention. For example if you are a male student, and your name, birth date and social security number did not find a corresponding match in the Selective Service database, you will receive a notice like the example above that you are not registered with the Selective Service. Fix the problem immediately online, then check back again after 3 business days to make sure it has been processed properly. Note in this example the student had registered with the Selective Service and upon receiving this SAR report mailed in a correction to the Selective Service, but after 6 weeks the issue was still not resolved and his schools had not received the FAFSA information. To fix the problem, he went in the the online FAFSA and indicated that he was NOT registered for the draft, and checked the option "Register Me". After 3 days, the problem was fixed online. Remember that snail mail is not the way to go, as it relies on someone at the other end to manually process your documents. With the cutbacks in many government agencies, this can take a long time. The SAR report is critical - it tells you if there is something wrong that will hold up your FAFSA financial aid process. Be sure to check and make it right, or you may not receive any financial aid for college that year!